For players looking for the ultimate light blade, Yasaka BALSA is a perfect choice. 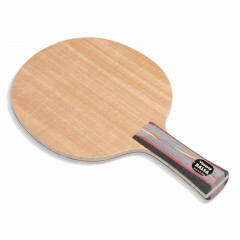 Using the very light balsa material in the center veneer, reinforced with synthetic fibres, combined with a hard outer veneer the BALSA blade has good speed and control characteristics with a weight of around 70 grams.When playing BALSA you get a new "feeling of freedom" in your game." Yasaka Blade Balsa is beeing added to cart.